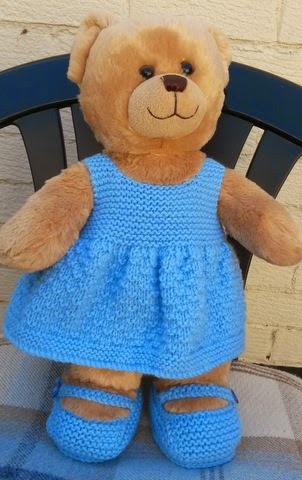 This is an easy knitting pattern for a dress and shoes. The dress skirt has a 4 row pattern. changing to garter stitch (every row knit) for the bodice. 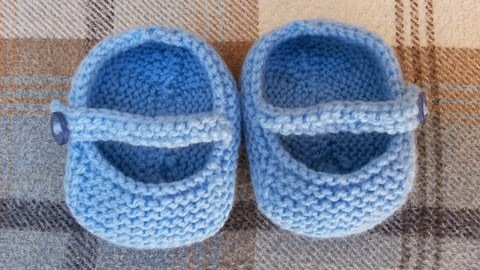 The shoes were inspired by some little bootees I made for my grandson a while ago. I had a bit of a fuss to get the right size for the sole of the shoe as teddy bears paws are large and round! I tried lots of different ways to edge the shoe - knitting a hem was way too fiddly and difficult to explain in a written pattern. I don't usually add any crochet in what is essentially a knitting pattern, but couldn't figure out another way to make a neat edge. 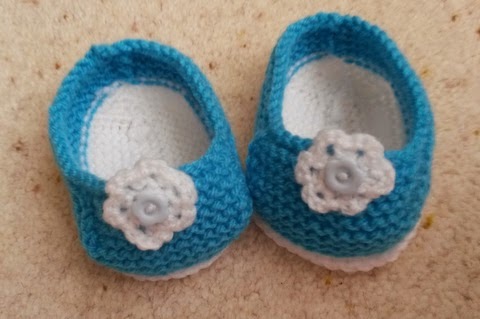 If you don't crochet, maybe you could top stitch round the edge just to make it stand out a bit which makes the shoes less like babies bootees..... I added the strap and then thought - what about little slip on shoes so made the motifs which I think works quite well. The pattern fits my 15" Lil Cub build a bear well and should be ok for small bears if you work a few less rows. If you have a larger bear its easy enough to add a few more stitches and adjust the pattern. 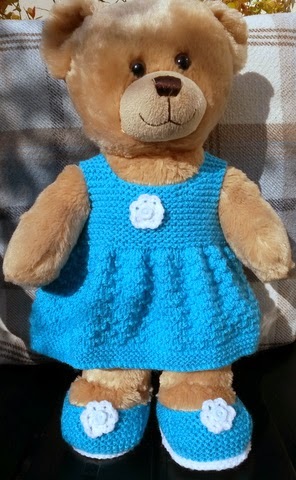 A few notes on Tension: I used budget yarn for this pattern which is great for dolls and teddy clothes but it tends to be a bit thicker than other double knit. Check your tension and measure your bear to make sure the dress fits. The shoes should fit most Build a Bears. The actual measurement of the dress is 8" from hem to shoulder and 16" around chest. Abreviations: k: knit, p: purl, tog: together, sts: stitches, yf: yarn forward, S1: slip one stitch, M1: pick up loop between last and next st and work into the back of this loop. (right side facing) Cast off 4sts at the beginning of next 2 rows. Rejoin yarn to remaining 8sts wrong side facing. Using no 3.5 crochet hook fold shoe along last row of sole (see picture) and beginning at centre back edge work a round of dc through loops. Sew strap onto shoe as in photo, placing button hole on outer side of right and left shoe. Sew on button to correspond with buttonhole. Change to contrast yarn and continue to end. Use white to complete edging.